You'll love taking a Lake Tahoe cruise. There are many Lake Tahoe cruises available so that you can easily enjoy fantastic sights around this wonderful Sierra Nevada lake. Bring the whole family. Sparkling Emerald Bay is only one stop when you go for a boat cruise around Lake Tahoe. There are many sights to see, not to mention the mixture of entertainment and dining as you experience a great ride around the lake. The MS Dixie II will be your favorite trip as you cruise on this mountain lake. 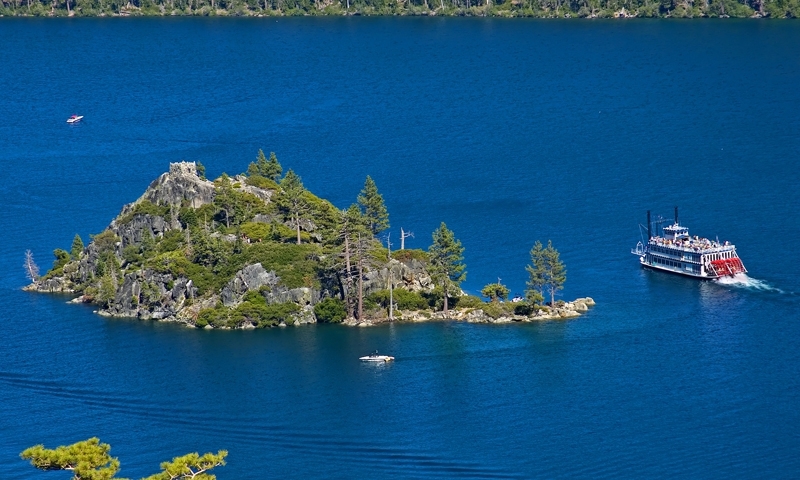 See the lovely island, the only one on Lake Tahoe – Fannette Island. No matter if you have taken this boat ride before, you'll see why many visitors return again and again. The Tahoe Queen will make your tour memorable, with music and great food. Watch the sunset as you glide over the crystal waters. The scents of the forests will intrude, and you may even glimpse some of the wildlife on shore. With such a serene setting, you will instantly shed all those worries. The mountain peaks, the quiet, the charm of the estates surrounding the lake – something you simply can't miss. The whole family will have a wonderful time, with more adventures awaiting you in the way of outdoor recreation once you reach shore. But you should just relax and enjoy your scenic boat cruise while it lasts, and take the memories with you.